October is Sensory Awareness Month, and we’re already focusing on next month because we want to help spread global awareness about this disorder. On Oct. 6-7, our partners at the STAR Institute for Sensory Processing Disorder will host their 20th Annual International 3S Symposium in Denver, Colo. The Symposium will highlight 20 years of research accomplishments with though-provoking research and strategy presentations by clinical experts. The Symposium is great for any individuals–occupational or physical therapists, special education teachers, early intervention specialists, parents and more–seeking a better understanding of Sensory Processing Disorder. And in addition to the two-day Symposium, the STAR Institute is hosting a pre-symposium workshop for parents focused on relationships and SPD across the lifespan. Learn more and register for the 3S Symposium and pre-symposium workshop here. And watch our short video below to learn more about the history of the STAR Institute. In September, our local playground consultant, Carolina Parks & Play, helped open Savannah’s Playground in Myrtle Beach, S.C. Ingrid M. Kanics, member of Landscape Structures Inclusive Play Advisory Board, was able to attend the grand opening, and today, as our guest blogger, she shares her experience of the event and takes us through the inclusive playground design. Labor Day typically marks the end of summer, but this year in Myrtle Beach, it marked the beginning of something amazing. Hundreds of people gathered to be part of the official opening of Savannah’s Playground. This inclusive playground, located in the Myrtle Beach Grand Park, takes playing to a whole new level. The playground itself provides visitors of all ages and abilities with activities that will keep them busy for hours. For the early learners, there is a whole area of assorted structures that will provide them with a whole mix of climbing and sliding activities where they can build their muscles as well as social and cognitive skills. This playground area includes ample seating and shade to support families with young children. Families will also find a huge collection of swings of assorted types. The collection allows children of all abilities the opportunity to experience this favorite childhood activity. The sheer number of swings ensures that wait times to get on a swing will be minimal compared to the regular playground experience. Group swings like the Oodle® Swing provide children with the chance to swing together with their friends. Nestled in a group of trees a bit off the beaten path is the Sensory Play Center®. Various activity panels encourage children to play with their sense of touch, sight and hearing. The curves within the wall create small nodes of play that support group play for two or three children at a time. This results in a quieter play area, which will support children with autism. Just down from the Sensory Play Center is Pulse® Table Tennis, an interactive and multisensory game. The lights and sounds attract children of all abilities to try their hand at electronic table tennis. As children play together, the game challenges their motor coordination, reflexes and reasoning as they try to out play their opponent. The quicker children play, the quicker the game becomes, thus challenging even the best athletes who come to the playground. Even more, a triple ZipKrooz® with assorted seating options ensures that children of all abilities are able to fly down the track to their friends on the other end. Individuals of all ages and abilities will enjoy flying through space! Once visitors have sampled all of the surrounding play spaces, they can dive into playing on the main playground structure. This huge ramped playstructure delivers a route of play that takes them 12 feet off the ground. Along the way to the top, there are a wide variety of play panels to explore, which will occupy their mind in play to build reasoning and problem-solving skills by engaging their senses. Kids can take a pit stop at the Sway Fun® glider, or leave the structure through the abundance of playground slides found at assorted levels on the playstructure. Plus, a variety of climbers that help build motor coordination and muscle strength are positioned throughout the playground so kids can quickly get back up to the fun. Set around this playground are inclusive playground components–the We-saw™, OmniSpin® Spinner, Roller Table and TopsyTurny® Spinner–that promote group play. Children and their friends can experience motion in fun and different ways! To say the least, Savannah’s Playground provided hundreds of kids with a great place to play on this Labor Day weekend morning. Every child will find their “just right” fit on this playground as it is designed to support their physical, sensory and cognitive needs while delivering a world of fun. It allows each visitor to build their socialization skills and self-esteem as they walk, run, roll, slide, climb, swing and spin together at Savannah’s Playground! Designers: Sheri Seminary, playground designer at Landscape Structures Inc. Solution: Their vision came to life as a 20-acre recreation complex complete with a rubberized ball field for children and adults with special needs, an inclusive playground, a concession stand, restrooms and a quiet room designed especially for children with autism. The inclusive playground focuses on access and offering sensory-stimulating activities including the Sensory Play Center®, OmniSpin® spinner, Roller Table, We-Saw™ and Sway Fun® glider. Even more, the playground integrates lots of shade right into the playstructure. Read more about how the City of Jonesboro brought their community together through inclusive recreation at the Jonesboro Miracle League Park. Last week, we were honored at the Sensory Processing Disorder (SPD) Foundation’s 1st Annual Banquet of Champions. Held at the Inverness Hotel and Conference Center in Englewood, Colo., the event brought together people to help raise funds for research towards understanding behavioral and brain differences in children with SPD. 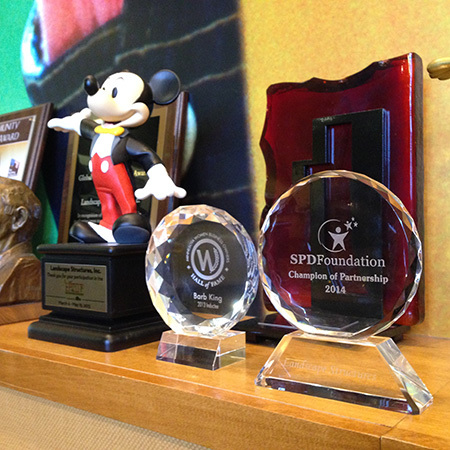 Additionally, the Foundation celebrated individuals and organizations that have supported the SPD Foundation. We were presented the Champion of Partnership award for partnering with the SPD Foundation to bring “The World’s Best Sensory Playground” to the STAR Center. The inclusive and sensory-stimulating playground equipment is used as a therapy tool for kids receiving treatment at the STAR Center. We’re proud to work with the SPD Foundation and support their research in sensory processing disorders, and honored by this recognition. Learn more about the SPD Foundation and the STAR Center, and go here to read more about our commitment to inclusive play. In June, we awarded the Iola Kiwanis club in Iola, Kan., $25,000 in playground equipment as part of the Make a Difference Through Play contest. Since winning, they’ve been busy with plans, and we’re happy to share another update from Michael Ford, member of Iola Kiwanis and community resource officer for the Iola Police Department. When our playground consultant from ATHCO, LLC visited with us to discuss the inclusive playground design, five representatives from the M.O.M.S. group were at the meeting along with the school’s physical therapist and a couple of Kiwanis members. We all paged through the Landscape Structures catalog—the moms focused on products that might specifically help their kids—and the rest of us picked out items that we thought we be fun for all kids. Some of the moms focused on including sensory panels because they figured that even though their children might not have a lot of muscle strength to climb or hang from overhead events, they can still participate and have fun. And I don’t know what kid isn’t going to enjoy beating on Bongo Drums or playing on a Xylophone, which is what some of the panels included. Another popular item was the Marble Panel™, which one mom whose child with vision problems picked out. The light shines through the marbles to engage kids’ sight, plus it offers a unique tactile experience. As a parent of kids without special needs, I never thought about sensory items as part of the playground, but now I see that it’s very important. And it’s important for the development of all kids. That, to me, is how we’re providing a truly inclusive play space. While the moms focused on sensory-rich activities, the physical therapist thought more about what kids—with and without special needs—need for building strength. She chose climbers that would engage kids’ full bodies. And she thought the Roller Table™ would be great for kids that don’t have any lower body strength, as they can lie down and pull themselves through. The design process has been very educational for us. The Cozy Dome®, which I just looked at as a fort or climber, can also be beneficial for children with autism to use as a “time-out” space if they get overstimulated. It was quite the learning experience to look at these playground products from a different point of view. After that first meeting, our playground consultant came back with a design that we all liked. The design is final; however, if we exceed our fundraising goal we’d love to add more inclusive playground pieces to the design. Stay tuned for another update from Michael next month. He’ll talk more about the importance of inclusive play to the community of Iola. We started gaining support for our inclusive playground project during the Make a Difference Through Play contest. The contest took place on Facebook so we were able to easily spread the word through the Iola Kiwanis club Facebook page, various community pages and each of our personal pages. With family and friends spread far and wide, we literally had support coming from around the world. When we entered the contest many people said, “What are the odds that little Iola, Kan., can win this contest?” But the power of social media showed that anything is possible. With our online outreach and word-of-mouth spreading through the community, we secured enough votes to get our project to the top of the list. After winning the contest and sharing our plans for the inclusive playground—including plans to have the project completed by April 2014—we were concerned that we would be confronted by naysayers, but we’ve had nothing but support. To help increase community involvement, we included the M.O.M.S. group and physical therapist from school to help our Kiwanis club create a truly inclusive playground design. While I was thinking wheelchair accessibility, they helped educate our group on the need for sensory play panels, playground spinners and swings, as well as quiet areas where kids with autism or sensory processing disorders can take a “time out” if necessary. While we move forward finalizing the design, we’re analyzing our site and creating an overall blueprint of the project. We’re also beginning to work more closely with the Iola Parks Department as they will be heavily involved with the installation and maintenance of the playground. Stay tuned for another update from Michael next month. He’ll talk more in depth about designing an inclusive playground.